Dotloop is a web based service that allows Realtors, buyers, sellers, and other third parties to collaborate during a real estate transaction. Your Realtor will use Dotloop to share documents with you that you can view, sign or fill out depending on the situation, all from your computer, smartphone or tablet. 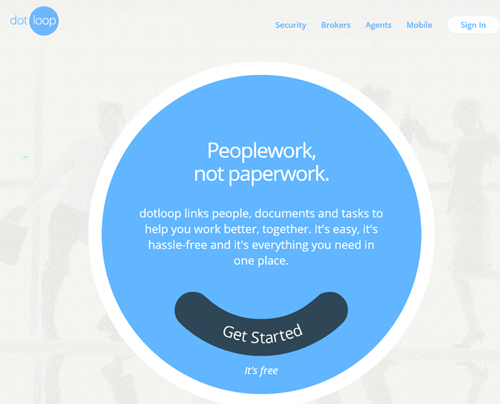 Dotloop organizes documents into containers called "loops". Each loop will usually correspond to one particular property. Within a loop your Realtor may organize documents into separate folders. For instance, if you are a seller, your loop might have listing documentation in one folder, and documentation relating to an offer in another folder. Depending on how you and your Realtor collaborate, you may have multiple loops pertaining to the same property. This is normal. While using Dotloop you will be requested to sign documents electronically. Each time you initial or sign a document, Dotloop creates a unique ID that ties that signature back to your account with a timestamp and IP Address embeded in it. This ensures that the electronic signatures on Dotloop documents can be verified and are secure. To learn more about Dotloop's compliance with eSignature laws visit: https://www.dotloop.com/documents-esign. If a document that you've signed is modified by your Realtor, or another Realtor, your signature will automatically be removed by Dotloop. This is a crucial feature that protects you and the documentation that you sign during your transaction. As a result your Realtor will often request that you resign things multple times. This is very common in the initial stages of negotiating an offer, as each party is continually modifying contracts and other paperwork. If you'd like to learn more about dotloop, watch this introductory video. Sometimes the invitation email from Dotloop will get stuck in your email account’s spam or junk folder. Make sure you look for an email from your Realtor with the subject line “Mary Jones shared a document with you” or “Mary Jones needs you to complete a document”. If you have thoroughly searched your junk and/or spam folders and still cannot find the email from Dotloop, try adding member@dotloop.com to your ‘whitelist’, ‘safe senders’ or whatever mechanism your email provider has that bypasses their spam filtering. If you are still unable to find the email invitation from your Realtor you can go directly to http://www.dotloop.com and click on "Get Started". Just signup using the email address that you provided your Realtor . Once you login you should find the loops and documents that your Realtor sent you. If you don't see a particular loop or document that your Realtor has said that they've shared with you, you may have more than one Dotloop profile. This can happen if you've used Dotloop with other Realtors or created your account before your Realtor invited you to their loop. To check if you have another profile, click on the Profiles icon in the top right of the screen. If you have more than one profile, try clicking on the one that is not currently highlighted in blue and see if your missing loops or documents are now accessible. Within each loop, documents are organized by folder. If you click on a folder name it will toggle that folder open or closed. In the closed state, all of the folder's documents will be hidden. If you just see a folder but no documents make sure that the folder is not closed. The Offer Folder below is currently closed. You cannot see it's contents. Clicking on the folder name opens it. If you are still unable to find the loops or documents that have been shared with you, try manually logging out of dotloop and signing back in. To log out, click on the profile button in the top right, and then click on "Sign Out". Or use this link to force a logout: https://www.dotloop.com/my/logout. Nearly all problems with signing documents are caused by using an old web browser; in particular, older versions (7,8 or 9) of Internet Explorer. If you are having problems signing, we would recommend using one of the following browsers. If you are having problems signing on an iPad or iPhone make sure you have the latest version of iOS. You can check by launching the Settings app, and then clicking General > Software Update.